WASHINGTON — In one of the most unsurprising news yet, a Pakistani report said that their country’s intelligence service was utterly incompetent in tracking international terrorist Osama bin Laden, who was killed by an American special operations team. 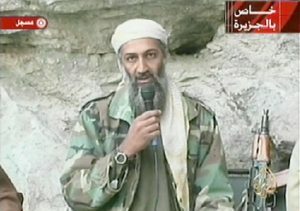 Reuters reports that the report, which was leaked to the Qatar broadcaster Al Jazeera, gave details about how bin Laden lived and how he avoided arrest and apprehension. Bin Laden had lived in “plain sight” for almost ten years and was actually pulled over for speeding one time, but was not taken into custody. According to the report, a trusted aide diffused the situation and he got away. The report interviewed 201 sources that include family members and several officials. He even wore a cowboy hat to avoid detection in his compound in Abbottabad, his wives told the Pakistani investigators. But the report slammed the “illegal manner” of the American special forces raid to kill bin Laden and criticized Pakistani intelligence for their failure to detect CIA activities on Pakistani land, even hinting at rogue elements within the Pakistani intelligence service.